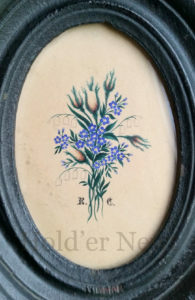 Among the documents, photos, and books I inherited from my grandmother, Clara Losee, were a handful of Victorian miniature paintings created by a woman called “Mrs. M. J. Manier”. On the reverse of her carte-de-visite, Clara’s mother-in-law Rosalie Fraleigh Losee had written: “Mrs. M.J. Manier who was an adept at painting flowers in water colors & who decorated the wedding cake for Lucy Irene Curtis when she married John A. Fraleigh June 14, 1871 & who decorated he cake for their daughter M. Rosalie when she married Harvey Losee, Sept. 5, 1906.” Included in the collection are a calling card, her photograph, a larger painting in the pages of a Victorian friendship album, a tiny framed painting, a little packet that unfolds to reveal a Christian verse, and a painting backed with ribbon (perhaps a bookmark) with a Christian verse. Her work is beautiful but until recently, I didn’t really know who she was. Fortunately, in 1900, she was living in Red Hook with her sister, so the data started to link up to pull her story out of the past and into the light. Mary Jane Moul was born in June 1832 to Philip Moul and Christina Shook of Red Hook. Her parents married 1 Feb 1816 at the Reformed Church in Upper Red Hook–the same that Rosalie Fraleigh Losee and her family attended. The Curtis and Fraleigh families, however, we Methodists. Mary Jane married William Manier born in 1817–a man 15 years her senior. They had two children, John born c. 1851 and William C. born c. 1854. They were both clerks throughout their lives. John married Sophie Smith and removed to Binghamton, NY. They did not have any children. John died in 1926 in Binghamton. William married Jessie H Lord and had one child, a daughter whose tombstone simply reads “Baby Lu”, died 1 Jan 1885. They are all buried in the Cemetery of the Evergreens in New Lebanon, Columbia County NY. In 1850, Mary Jane and her husband lived with her parents and sister Hannah (20 Oct 1820-9 Jan 1904, then the widow Shook) and her son Lorin Shook in Red Hook. In 1860, Philip and William had both died and Hannah and Lorin moved out. Lorin was old enough to be on his own (he married after 1860 Harriet Hermance) and Hannah remarried, possibly Isaac Cookingham. This was the same household situation in 1870. According to the New York State census of 1875, Mary Jane and her sons who were in their early 20s moved to Binghamton, they had a domestic servant in the home as well. Also residing there was Alexander Manier and his family, who appears to have been a brother to her late husband William. He, his wife and children, and Mary Jane’s son John and his wife are buried in the Spring Forest cemetery in Binghamton. 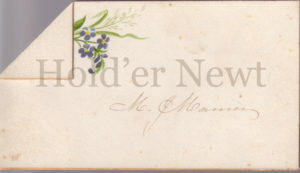 Mr. J. Manier calling card – probably her son, John. In 1897 Robert W Manier of Binghampton made a request to the people of Rhinebeck in the local paper looking for info on John Manier from Dutchess County who served in the Revolution and his son John Manier of Rhinebeck who was a member of “Captain Obadiah Titus’ company, Delamater’s Regiment of New York Militia” in the war of 1812. He was doing family history research. Robert’s father was James W, son of Alexander, son of John Manier. It is likely that the John Manier in the War of 1812 he was interested in was his great-grandfather (and William Manier’s father). 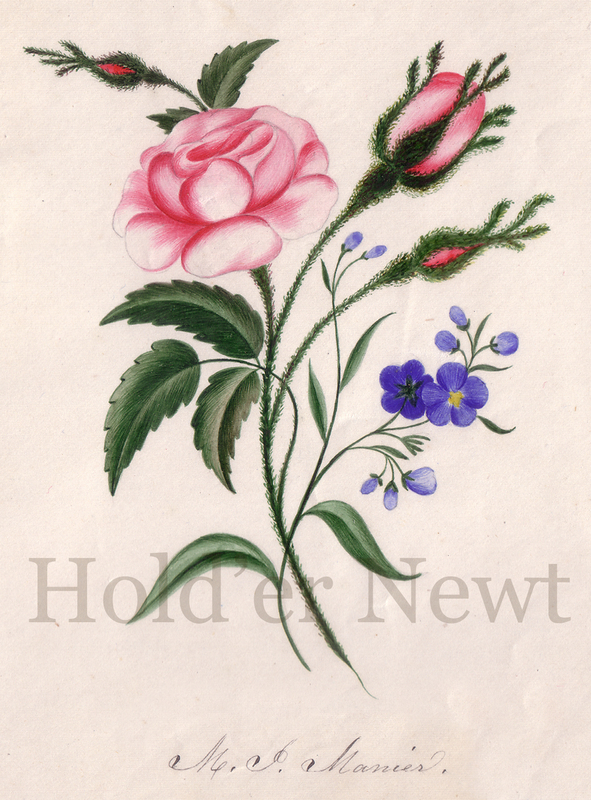 Rose painted on a page in a Victorian autograph album, probably belonging to Lucy Curtis. Initials R.C. 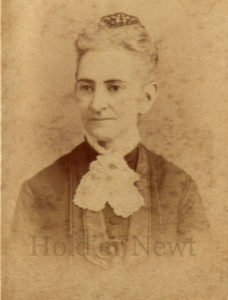 – label on reverse reads “nee Canfield” or Lucy Curtis’ mother, Rachel Canfield Curtis. In 1880, Mary Jane and her family were still in the same location, but then with John’s new wife Sophia Smith and her mother Jane W Smith. Son William had moved out. I couldn’t find her or son William in 1892, but in 1900 Mary Jane is back with her older sister Hannah (also listed as a widow) in Red Hook. Hannah died in 1904 so in 1910 Mary Jane got shuffled around again, going to live with her son William and his wife Jessie in Brooklyn. William died 7 Dec 1912 and Jessie died 30 Jan 1919. Mary Jane Moul Manier died 13 Mar 1917 in Binghamton (probably having had to move yet again to be with her son John after son William’s death) and is buried in the Lutheran cemetery in Red Hook with her husband, sister, and parents. BURIED AT RED HOOK The remains of Mrs. Mary J. Manier who formerly resided in Red Hook, and who died in Binghamton, March 13 were brought to Red Hook on Thursday afternoon and buried in her plot in the Lutheran cemetery. She was 85-years of age, She leaves one son, John Manier, of Binghamton.